Last time we took a look at the tools, but this time around I’m going to actually start with the painting! This photo is to scale! 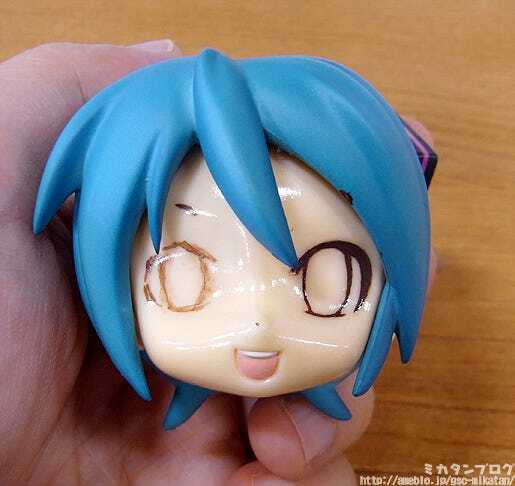 The Nendoroid head looks so much smaller when you know you’re going to be painting on it yourself! First off, I drew on some rough lines! I drew these on while the fringe was attached to make sure they were in a good position. I’ll explain more about these rough lines a bit later, but basically they can be erased easily so it doesn’t really matter how messy they look! The road to success is to copy the best! 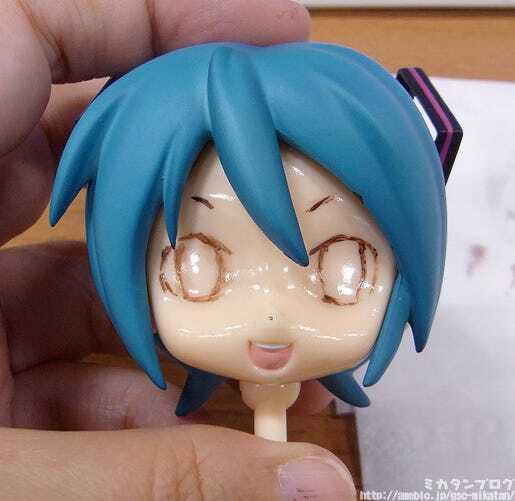 I definitely need something to base my painting on seen I don’t have any real experience, so I’ll be copying the eyes from this Miku Nendoroid! I know very well that I wouldn’t get very far if I tried from scratch, so I’ll keep this Miku on the side as a reference model! 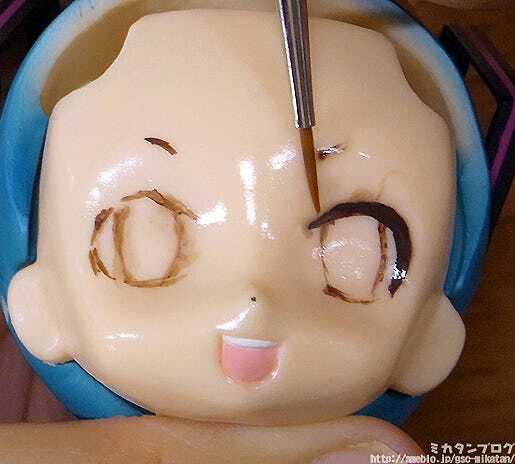 I decided to start with the upper eye lashes! 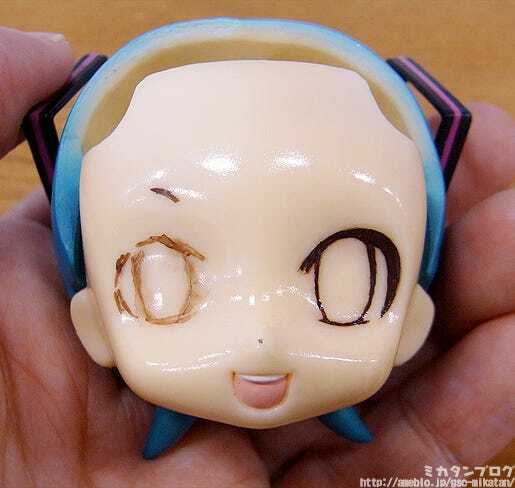 Unfortunately they seem to have come out a bit thick and crooked… I also managed to brush some paint onto the left side of the eye… I’m sorry Miku!! But you don’t just paint once and be done with it! 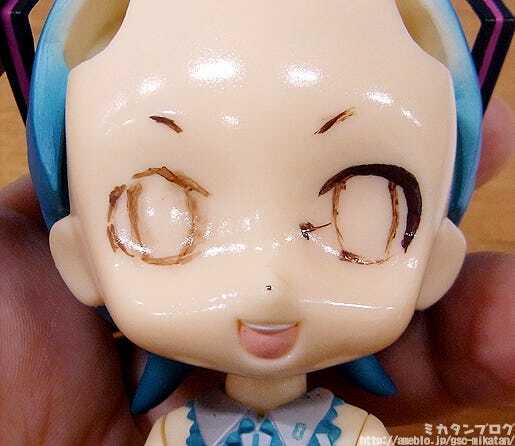 You need to paint and erase over and over again until the expression looks right! Let me try explain with a picture! The left represents what I’ve done so far! Now I’ll take the wobbly paint lines and make them look neater by using enamel thinner! In other words I’ll basically be erasing the pink section on the image above, to create a straighter, neater line! That’s the basics of it least, so let me give it a go! Cleaning up the outer eye! Here I’ve actually used too much thinner, which is causing the paint to smudge a bit!! At least the line itself does look a little bit neater! A comparison of the two! 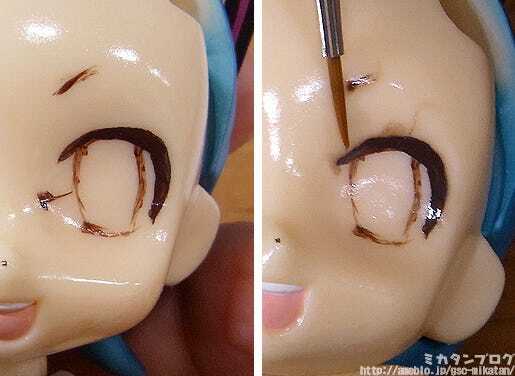 You really only need the tiniest drop of thinner, I used too much (Just dab a small amount on the brush and then dry it a little bit before applying it to the figure). You don’t need to worry about the smudges as they can be cleaned up quite easily later on. You’ll need three paint trays! The top two filled with enamel thinner. The one on the left is to clean the brushes. 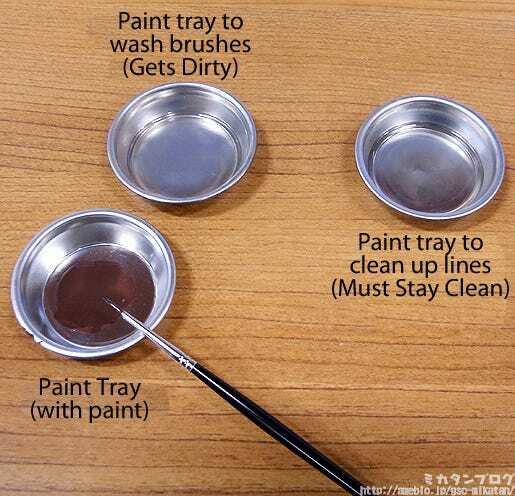 Once paint collects on a brush it’ll slowly get harder and harder to use, so make use of the enamel thinner to clean off the paint from them when you’re done with a color. That means that the thinner on the left can get dirty without a problem – you’re just using it to clean off the paint. 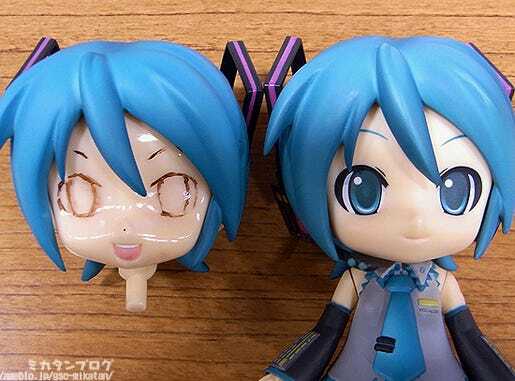 The one on the right is for thinner used for cleaning up the lines as I was previously doing on Miku. 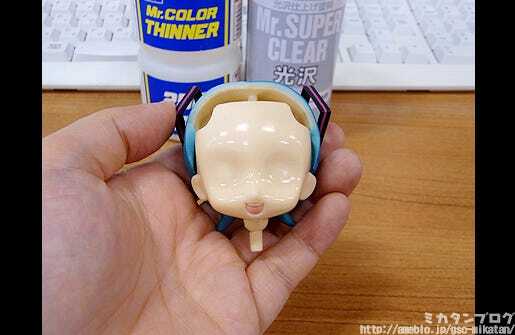 You need to keep paint out of this thinner, as if it gets dirty you won’t be able to remove the unwanted lines neatly. If you think it’s looking a little dirty, consider replacing the thinner with some fresh thinner to continue your work. 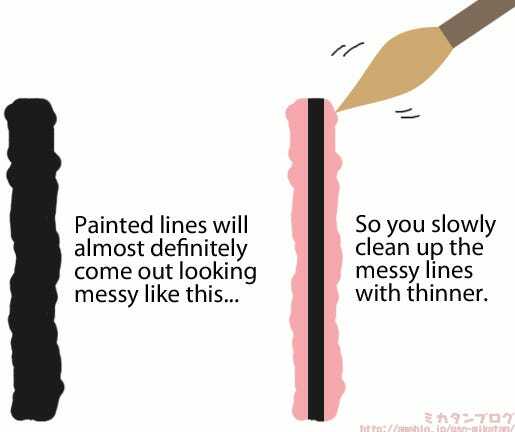 Its best to have two brushes, one for paint and one for thinner! 2 and a half hours have passed!! … and I’m still having fun!! You really have to concentrate or you make mistakes so easily… but the thought of completing Miku’s expression is enough to keep me going!! Oda-P gave me some advice, saying that I should hold my pinky finger to the head part to help keep it stable, and it really did help me quite a lot! If you’re trying this for yourself, be sure to try the pinky trick! The lines look a little wobbly still, but I think it came out looking alright! Yay! I put the hair part back on! Everyone said the expressions were really hard to work with, but I think this will come out looking great!! 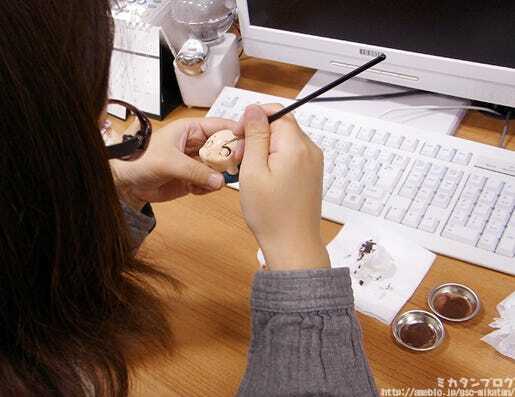 Maybe it’s time for me to leave the WEB team and join the Nendoroid team! I’ll be continuing this blog tomorrow! !